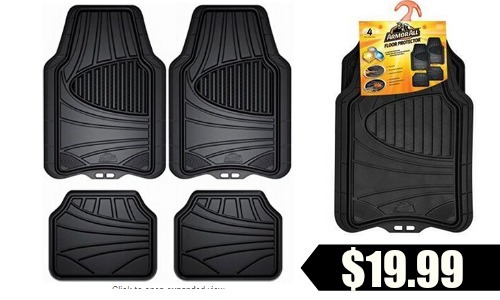 Need some new floor mats for you car? Both Amazon and Home Depot are currently offering the Armor All 4-Piece All Season Rubber Floor Mat Set for just $19.99, regularly $29.99. The neat thing about these mats are that they can be trimmed and customized to fit most vehicles. They are also supposed to hold up against very cold weather and not curl, harden or crack! Prices subject to change at anytime with Amazon. Shipping is FREE with Prime.